Hello Don Julio won the Laurel Turf Cup. Photo by Laurie Asseo. Grade 2-placed Hello Don Julio, making his Laurel Park debut, relaxed on the lead under jockey Channing Hill and displayed good energy when asked down the lane to dismiss 99-1 long shot Cooptado for a popular three-quarter-length win in the $100,000 Laurel Turf Cup. It was the fifth career win and first in a stakes for Michael Dilger owned-and-trained Hello Don Julio ($5), favored at 3-2 in the field of 11. The winning time for 1 ½ miles was 2:34.63 over a good All Along turf course. Breaking from Post 4, Hello Don Julio was able to outrun Final Copy on the inside to the lead through a quarter-mile in 25.48 seconds. Final Copy was swung outside by Hall of Fame rider Gary Stevens and took a short lead after a half in 51.14, but it was short-lived as Hello Don Julio got it back and went six furlongs in 1:16.45. Cooptado swung into a contending position three wide around the far turn but was unable to reel in Hello Don Julio through the stretch and wound up 3 ¾ lengths ahead of Postulation in third with Final Copy checking in fourth. They were followed under the line by Scuba, Vintage Matters, Not in Charge, 2016 Laurel Turf Cup winner Renown, Decisive Triumph, Tizzarunner and Barney Rebel. Hello Don Julio, a 6-year-old son of 2005 Preakness (G1) winner Afleet Alex, closed 2017 running third in the Knickerbocker (G2) at Belmont Park and was winless in three tires this year, beaten 1 ¼ lengths while seventh in the Manhattan (G1) in his seasonal debut. Midwest-based Hill was riding for the first time. Epic Racing’s Valedictorian became a stakes winner for the second time in her career with a front-running 1 ½-length triumph in the $150,000 All Along Stakes, presented by Blackwell Real Estate, Saturday at Laurel Park. 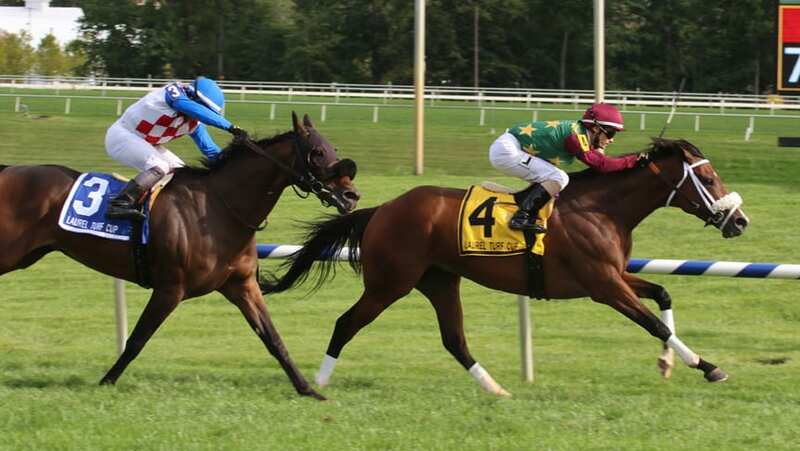 The 1 1/16-mile All Along for fillies and mares 3 and older and the 56th running of the $100,000 Laurel Turf Cup, presented by Ourisman of Clarksville, for 3-year-olds and up going 1 ½ miles were among six stakes over Laurel’s world-class turf course that complemented the 27th running of the $250,000 Xpressbet Frank J. De Francis Memorial Dash (G3) on a 13-race Fall Festival of Racing program. Under a heady ride from fan favorite J.D. Acosta, Valedictorian ($27.40) forged a comfortable early lead and had something left in the final sixteenth of a mile to turn back her 10 rivals and win in 1:45.74 over an All Along turf course layout labeled good. A 4-year-old New Jersey-bred daughter of Temple City out of the Smart Strike mare Smart N Classy, Valedictorian was hustled to the lead from the gate and was in front through fractions of 23.84 and 48.08 seconds tracked by 40-1 long shot So Innocent to her outside. Valedictorian remained in charge through six furlongs in 1:12.92 as 3-1 favorite Stormy Victoria picked up the challenge on the turn. Valedictorian extended her advantage once straightened for home and held sway as fellow stakes winner Mythical Mission put in a late bid to run second. My Impression, trained by Hall of Famer Shug McGaughey, who had won the previous two runnings of the All Along, rallied on the outside to catch Lift Up by a nose for third. Quick Witted, Not Taken, Stormy Victoria, Esquisse, So Innocent, Celestial Insight and Sophie is an Angel completed the order of finish. It was the ninth win from 21 career starts and third in the last four tries for Valedictorian, head winner of the one-mile Jersey Girl Handicap July 4 at Monmouth Park. She is trained by Kelly Breen. Backwards Stable’s 5-year-old homebred mare Fire Key, second in last year’s Sensible Lady, held off a late rally by Glen Hill Farm’s Compelled to win Saturday’s $100,000 Sensible Lady Turf Dash over a good Fort Marcy Turf Course. Trained by Patrick Kelly and ridden by Julian Pimental, Fire Key, winner of the Autumn Days Stakes at Aqueduct in November, has now won six of 16 starts on the turf and finished second on the turf another five times. Fire Key came into the Sensible Lady off a troubled 11th place finish in the Smart N Fancy at Saratoga Aug. 26. After Daylight Again and Smiling Causeway battled past a :23.87 opening quarter, Rocky Policy took the lead entering the stretch. But Fire Key moved six-wide entering the stretch, overtaking Rocky Policy and holding off Compelled at the finish line. Making just her second career start and first in a stakes, Lael Stables’ Monkeys Uncle swept to the lead on the far outside and powered through the stretch to win the $100,000 Selima. Ridden by Daniel Centeno for trainer Arnaud Delacour, Monkeys Uncle ($18.40) ran six furlongs in 1:16.11 over a good Fort Marcy turf course to win by a half-length. Shoobiedoobydo came with a steady run along the inside for second, a half-length ahead of Helen in third. Elsa, the even-money favorite, raced near the back of the pack in between horses and wound up seventh. Unhurried in the early going as Margie Is Livid took the field of 11 through fractions of 24.09 seconds, 50.17 and 1:02.89, Monkeys Uncle was steered to the outside by Centeno rounding the far turn and remained wide to make her winning run, catching Margie Is Livid in mid-stretch and turning away Shoobiedoobydo to the inside. Monkeys Uncle was cutting back from her debut victory under Centeno going a mile and 70 yards Aug. 30 at Delaware Park.